President of Columbia University, the Provost, University administrators, renowned professors and scientists, especially my mentor, colleague, and friend, Dr. Pedro Sanchez, winner of the World Food Prize, the MacArthur Foundation “Genius” award, and a chief of the Luo tribe in western Kenya and chief of the Ikaram of southern Nigeria. I also wish to specially acknowledge another great mentor of mine, Professor Jeffrey Sachs. Both Pedro and Jeff have done so much for food security in our world and we should celebrate them. Distinguished guests, ladies and gentlemen. I wish to congratulate the Earth Institute of Columbia University on this occasion of the inauguration of its Agriculture and Food Security Center. It is an honor to be in Low Library, this historic setting in which Nobel Prize winners, presidents of African countries, the Dalai Lama and dozens of internationally recognized leaders have spoken on the biggest issues facing the world. I am delighted to speak to you today. I applaud Columbia University for this Centre, which with its emphasis on applied, field-based research and advocacy is the first of its kind at any Ivy League university. There are obviously no “ivy towers” for Columbia University. Rather, you have been, and continue to be, a pacesetter in taking a multidisciplinary approach to solving some of the world’s largest problems. The Earth Institute, with support from the Bill & Melinda Gates Foundation, has also established the African Soil Information Service (AfSIS) to create a digital soil map. This will make it easier to precisely determine soil health status of vast land areas to improve soil fertility management interventions. Pedro, your leadership was instrumental in conceiving this scientific project and in getting it off the ground. This project will further strengthen Africa’s capacity to achieve a sustainable green revolution. Take the case of Soil-Doctor – a revolutionary technology for testing soil health conditions right in the farmer’s field. Instead of sending a sample to a lab, which can take months, the farmer gets results right away. Just like doctors treat sick people, soil doctors will treat sick soils. And healthier soils translate into healthier crops and a healthier population. My Ministry is delighted to partner with Columbia University on this project. We are purchasing 100 Soil Docs for our extension program in Nigeria, a critical element of our agricultural transformation. Columbia University is a strategic partner with Nigeria. That is why I am very pleased to share with you today my country’s experience in achieving food security and unlocking the potential of our agricultural sector. A lot of what I do today as Minister of Agriculture for Nigeria is informed by the world-class training I received in the United States. As a Ph.D student at Purdue University in the early 1980s, I saw first-hand the contributions the land grant university system made to the transformation of agriculture in America’s Midwest. The USA invests heavily in agricultural research and development. It makes sense. A nation that cannot feed itself is not a free country. There can be no democracy without first a democracy of the stomach. Science, technologies and innovations will become even more important as the world’s population rises to 9 billion by 2050, with less land available to produce food and declining levels of water. The focus must therefore be on how to produce more food, with less land and water, while conserving the environment. The scenario has played out before. In the 1960s, the world was under the spell of Malthusian theory, with rising concerns that agricultural growth will not be able to keep up with population growth. What the Malthusian theory did not consider was the power of science and technology to break yield barriers. The green revolution, with high yielding varieties of wheat and rice, transformed Asia. India – which a Nobel Prize economist once considered a “basket case” – soon became a major exporter of food. Ladies and gentlemen, nothing is more important than food. A nation that does not feed itself becomes a threat to its own sovereign existence. Growing our own food, processing what we produce, becoming competitive in export markets, and creating jobs all across our economy, are crucial for our national security. Nigeria was food self-sufficient in the 1960s and was well known for its global position in major agricultural commodities. We found oil and became too dependent on it. Nigeria soon became a net food-importing nation, spending on average $11 billion on importing wheat, rice, sugar and fish alone. Diamonds may last forever, but oil does not. The future trajectory of earnings from crude oil does not look good, as other nations are finding shale oil and shale gas. We must free ourselves from dependency on crude oil. Agriculture is the sector where we have the greatest potential to achieve this – and now is the time. 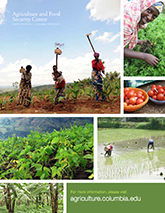 Nigeria has immense agricultural potential. We have 84 million hectares of arable land but only cultivate 40%. We have 263 billion cubic meters of water – with two of the largest rivers in Africa. We have a cheap labor force to support agricultural intensification. Our population of 167 million makes us a huge market. But we must not be the market for others. We must grow our own food. We must feed ourselves. We must create markets locally for our own farmers. Charity begins at home. While our potential is great, no one eats potential. To unlock the potential of agriculture to once again drive the economy, we embarked on a major transformation of the agricultural sector. We are doing this through the rapid transformation of key agricultural value chains – from the farm to the table. We are treating agriculture as a moneymaking business and not as a charitable development project. President Jonathan launched the Agricultural Transformation Agenda in 2011, with the goal of adding an additional 20 million MT of food to the domestic food supply by 2015 and stimulating the creation of 3.5 million jobs along the agricultural value chains. We are working to create ecosystems in which small, medium, and large-scale farming not only co-exist but also flourish. We are focusing on creating value added products from staple crops – through an aggressive import substitution program and other policy reforms to accelerate food production and agricultural resilience. Let me share with you a few of our policy reforms. The backbone of any agricultural revolution is access of farmers to modern agricultural inputs, especially fertilizers and seeds. For decades, successive governments in Nigeria procured and distributed fertilizers. This system was corrupt and undermined the private sector. It did not deliver fertilizers to genuine farmers. Instead, rich and powerful political farmers hijacked the subsidized fertilizers. As a result, no more than 11% of all the farmers in the country got the fertilizers distributed by the government. Corruption was insipient, as sand was mixed with fertilizers and sold to government, payments were made for fertilizer not supplied, and subsidized fertilizers were resold back to government, with a lot more sold off to the neighboring countries. To put it bluntly: Nigeria’s government was not subsidizing farmers; instead it was subsidizing corruption. Farmers’ powerlessness worsened as high quality seeds and fertilizers they needed to raise their farm productivity were taken over by the elite, the rich and politically powerful. For the few fortunate farmers that got fertilizers, they often got them in bowls, like beggars. Farmers lost dignity. But we have changed all that and so much has been achieved. Within the first 90 days of my term as Minister, we ended four decades of fertilizer sector corruption. We launched the Growth Enhancement Scheme – GES – to provide subsidized inputs to farmers. To reach farmers directly with seeds and fertilizers, we developed the Electronic Wallet System, which allows farmers to receive subsidized electronic vouchers for their seeds and fertilizers on their mobile phones. Nigeria is the first country in Africa – possibly in the world – to develop the electronic wallet system for targeting farmers with subsidized farm inputs. The system worked successfully. In 2012, 1.5 million smallholder farmers got their subsidized seeds and fertilizers using their mobile phones. This had an impact on 7.5 million persons. So far this year, over 3.5 million farmers have received their subsidized inputs via the Electronic Wallet Scheme. We have expanded the GES program beyond crops to provide support for fisheries, livestock and mechanization services. To reach even more farmers, we embarked on the nation’s first ever registration of farmers. This year, we registered 10 million farmers. Farmers now have identity cards that allow us to use their biometric information to target them more effectively. African countries, as well as Brazil, India and China, have expressed interest in adopting the electronic wallet system for reaching their own farmers with subsidized farm inputs. Nigeria is now exporting transparency. Indeed, this is a new dawn. Our agriculture has moved into the 21st century. Nigeria is the largest importer of rice in the world. That is a not a gold medal to be proud of. We embarked on a major effort to extricate Nigeria from decades of dependency on rice imports. To achieve this, we set a target of being self sufficient in rice by 2015. This is not a mirage. We are well on our way to achieving this goal. In one dry season last year, Nigeria produced over one million MT of rice paddy – one third of the additional rice paddy needed to become self sufficient in rice. Farmers across ten states of northern Nigeria had never witnessed such massive rice production. The villages boomed with economic activity, in the midst of the dry season when the youth would normally fold their hands with not much to do. As trailers could not make their ways into the rice farms, villagers even devised new means of transport, using camels to haul the bountiful harvest to the markets. Large-scale commercial rice producers are also expanding the production of rice locally. Dominion Farms has invested $40 million in a commercial rice farm. Olam, another private firm, has expanded its rice cultivation by 10,000 ha, in response to the policy incentives by our government. Fourteen large-scale integrated rice mills were established by the private sector in just two years, producing international quality long-grained parboiled rice. Well-packaged, long grained parboiled local rice is now on the market. It is tastier and healthier than the 15 year-old imported rice dumped on the Nigerian market. The jinx has been broken. We will soon be free from rice imports! To reduce our almost $ 4 billion import bill on wheat annually, we embarked on the cassava flour substitution policy to replace some of the wheat flour used in bread and confectionaries. Today, several of the major Nigerian bakers have shifted to the incorporation of 20% high quality cassava flour in producing bread. As the commercialization of cassava bread reaches its peak, it will reduce our wheat import bill by at least almost $800 million and put this money back in the pockets of Nigerian farmers, processors and bakers. To accelerate the production of high quality cassava flour, the government is supporting the private sector to access cheap financing to import and establish 18 large-scale cassava-processing plants. To further scale up nation wide production and commercialization of cassava bread, President Jonathan established a $60 million cassava-bread fund. The whole cassava value chain is being transformed. In Kogi State, about 15,000 ha is being developed by Cargill to produce cassava starch and reduce our imports of starch. In Kwara State, the Flour Mills of Nigeria has come in to establish plants to turn cassava starch into sweeteners to reduce sugar imports. Nigeria has secured a total of 3.2 million MT of cassava chips for export to China. When concluded, this will earn farmers and processors over $800 million. A silent revolution is also happening now for wheat. We have released new tropical wheat varieties that are heat tolerant, which give yields of 5-6 tons per ha – 500-600% more than the yields obtained previously by farmers. Over the next two years, over 450,000 ha will be planted under these new wheat varieties across the wheat growing belt of northern Nigeria. We plan to produce at least 2.5 million MT of wheat. We will reduce wheat imports by 50% by 2015. And what a relief that will be. We are changing the narrative in our horticultural sector. Nigeria is the second largest producer of citrus in the world, but we import orange juice. We are the largest producer of pineapples and mangoes in Africa, but we import concentrates from South Africa. We are the largest producer of tomatoes, but we import tomato paste. That is now changing. Teragro, a local private firm, has established a $ 6 million plant to process oranges into concentrate. Dansa Foods, another local private firm, is investing $35 million in the establishment of a tomato processing plant. The company is also investing $45 million to set up a 6,000 ha pineapple plantation and processing plant. To develop the export market for fresh produce from Nigeria into Europe, a fresh produce value chain development program has been launched in partnership with the Ministry of Aviation. We are building cargo airports to enhance our competitiveness in the export of fresh produce. We are restoring Nigeria’s lost glory in palm oil production. We are recapitalizing our plantations by providing 9 million high yielding improved seedlings of oil palm to smallholder farmers and plantation estates in the country – free of charge. Private sector investments are expanding with new palm oil processing plants. In cocoa, our target is to double production by 2015. The world cocoa industry has already taken notice of the giant strides we have made. We distributed 3.5 million pods of high yielding cocoa hybrids to smallholder farmers – all free of charge – in addition to support for production inputs. Last year our smallholder cocoa farmers earned $900 million in foreign exchange. The private sector has expanded its processing capacity for value addition to cocoa beans. Really, we should be making chocolates in Africa. We are transforming our livestock sector. Our Halal-certified beef with cold chain logistic systems is now poised to go international. We are also working to make Nigeria self-sufficient in fish production within four years, by encouraging aquaculture, inland fisheries and marine fisheries. To further build the resilience of our food system, we completed a total of 10 new silos for strategic food reserves within one year, expanding our silo capacity by 400%. These silos are now being provided under concessions to the private sector, for the establishment of world-class agricultural commodity exchanges. We are driving a public sector enabled and private sector led agricultural transformation. In the past 24 months, we have attracted $ 4 billion in executed letters of intent for investments. Development financing institutions, including the World Bank, African Development Bank and International Fund for Agricultural Development are putting in about 2 billion dollars in support of our agricultural transformation. The impact of the agricultural transformation agenda has been huge for Nigeria. In just one year, we have already produced an additional 9 million MT of food. At the same time, our food imports declined by $5.3 billion. Over 2.7 million farm-jobs were created – 77 % of our overall target. And just this year, the FAO recognized Nigeria for outstanding achievement in reducing the number of people suffering from chronic hunger. Agriculture has become the new buzz in Nigeria. Young graduates are moving into agriculture as a business. Just last week, President Jonathan launched the Youth Employment in Agriculture Program (YEAP) to create a new generation of young commercial farmers and agriculture entrepreneurs (“Nagropreneurs”). The program will develop a total of 760,000 ‘Nagropreneurs’ within five years. Today, bankers are leaving the banks and heading for agriculture. The new millionaires of Nigeria will be in agriculture. It is a new dawn. The journey to make Nigeria a global powerhouse in food is still ongoing. But the results we have achieved in two years make me confident that we will get there. For agriculture was Nigeria’s past and in agriculture – as a business – lies Nigeria’s greater future!